Here’s a common dilemma for businesses: you get PLENTY of online traffic on your website – BUT hardly any of them become actual paying customers. Sound familiar? It’s a well-known scenario even for big brands. Businesses do almost everything these days to attract audiences: from supporting a recent cause to uploading a video ad with dancing people. But like misers on a bookstore, they enjoy scanning books for free, but rarely buy anything. You may be thinking that the answer to this problem is SEO. Well, yes and no. Yes, because it will involve search optimization (no digital marketing strategy will work without one!). No, because there’s another process that can help solve this dilemma: conversion rate optimization or CRO. If you search for conversion rate optimization on Google, you will find that they all arrive at the same definition: CRO is a continuous process that involves turning – or converting – online visitors into leads or paying customers. Now it gets tricky. If you noticed, there are three important terms you need to be aware of when learning the basics of CRO: continuous process, conversion, and customers. First, understand that conversion rate optimization is – and always will be – an on-going method. Sure, you can hire someone for three or six months, do CRO, then be satisfied with a 30 percent increase in revenue. But the truth is: you might NOT get the same profit after the campaign is over. And that’s the scary part. That is why YOU need to learn CRO so you can continue the procedures long after your contract has expired. Second, know the kind of conversion you want. Now, many digital marketing blogs or articles will tell you that conversion is only when a person buys something from your website. In fact, ANY type of action can be recognized as conversion. It all depends on your GOAL as a business. For example: if you want more people to read your blog, then folks opening your email newsletter are already a conversion. It definitely pays to be clear on what you want before getting involved with CRO. Last, are your customers. They are the very reason why conversion rate optimization even exists. This process is for THEM. When people feel confident and secure in your website, they will be more inclined to do what you ask of them. It’s similar to having an old, dear friend. You’re more likely to do him or her favors because you feel comfortable. One of the things you should be is an expert on your customers. 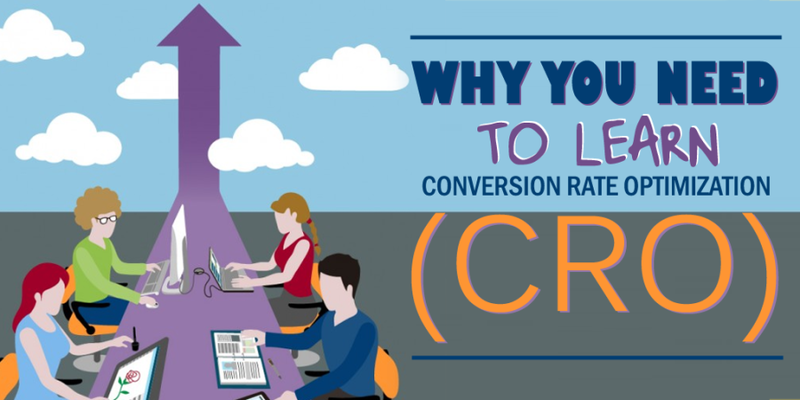 There are other key terms in CRO, such as A/B Testing, Targeting, and Variation that you should familiarize yourself with. But for now, it’s vital to focus on those three mentioned above as they are the building blocks of the whole concept. The first myth is deadly for both the digital marketing agency and the business owner. 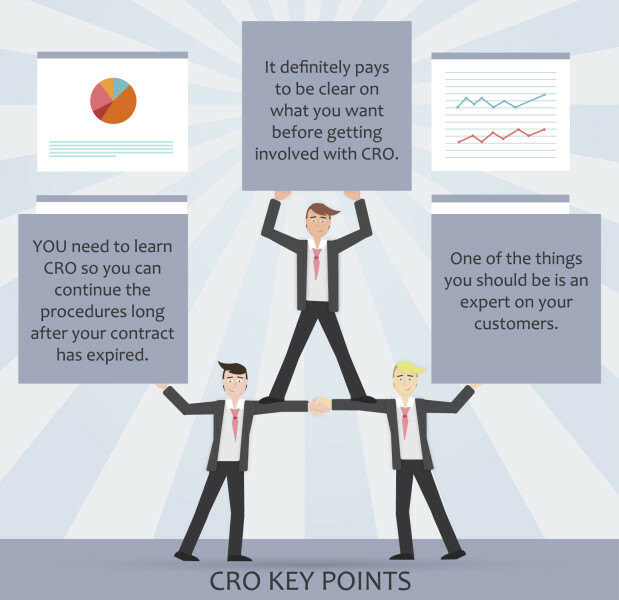 For one, CRO is akin to SEO: you will often see the best results only after an extensive period time (usually after four to six months). You can argue that time is money – but as CRO may require frequent changes to your website, it would be difficult to properly measure their effectiveness unless a good amount of time has passed. Second, conversion rate optimization need not stop at the campaign. Changing your web copy or performing A/B tests is just the beginning. Again: it’s an on-going process. Once your CRO campaign is over, you need to think of other clever ways to RETAIN paying customers. This ensures that they will keep coming back to you over their lifetime. Third, bigger conversions don’t necessarily translate to bigger income. Remember what we said earlier about conversion? They can mean different things based on your business goal. So if you really want to see huge differences in your profit, don’t just aim for better conversions – aspire to get conversions that equal revenue. For example: instead of simply getting people to view your product page, why not subtly direct them to click on the BUY button. You should also remember that as conversion rate optimization is a continuous process, it will involve many tests. So it’s crucial that you prepare mentally (and emotionally) for analyzing lots and lots of data. If you already have SEO, then you’re probably thinking that getting CRO along with your existing campaign means more pain in the pocket. That may be true (after all, hiring experts is not cheap! ), but think of CRO as an investment that pays for itself MULTIPLE times. Consider a case in 2013, when Walmart Canada unveiled its responsive website and gained a whopping 20 percent boost in conversion, with 98 percent more mobile orders. They looked at their data and realized most of their traffic was coming from tablets. The company saw this as an opportunity to provide a better experience – and so a responsive site was born. Another awesome example would be Sunshine.co.uk’s case study. Back when the U.K. had economic troubles (so travel was slow), the website still managed to double its revenue thanks to CRO. The first – and most important thing – they did was to conduct a survey as to what their customers liked about them. Using this data, they are able to improve (or optimize) their website accordingly. As you can see, it doesn’t matter whether you paid someone $1,000 or more to enhance your website to get more conversions. At the end of the day, what matters is that the people or company you chose to hire was able to earn you money. After all, that’s what conversion rate optimization is about. Aside from the argument that CRO is too expensive, there’s also the fear that numbers will start falling the moment the campaign is ceased. Well, this is also a yes and no. Yes, because CRO needs to be constantly performed in order to yield the best results. No, because if performed right along with other strategies, there’s no reason NOT to see positive conversions. It all starts by understanding HOW your customers treat your website. What attracted online users to your site? Why are they leaving? What makes discard an action midway? Once you have answers to these questions, you can move onto WHAT drives your customers to a purchase. A good CRO expert knows this – and more. He or she will know that today, businesses need more than traditional CRO techniques to win. They need long-term solutions that still have the same aim in mind: to enhance a customer’s experience online so they become actual buyers. One example of an underrated CRO tactic is ‘re-marketing’. In essence, this involves targeting people who visited your website but did NOT complete an action. This is a form of effective CRO in that it serves customized solutions for those who felt unsure of a transaction. This simple act can double or even triple your income based on how well you provide answers to your customers’ needs. That’s right: whether you want more people to click on your SUBSCRIBE button or to open the emails you keep sending, you won’t know how effective something is unless you test it. This is what makes CRO cool. Think of it as an ever on-going process of self-improvement. Don’t be afraid of making mistakes. They will lead you to the best CRO technique that’s right for your business. Conversion rate optimization may seem complicated, but with the help of experts, you’ll be analyzing data like a pro in no time. If you don’t have in-house web professionals, never hesitate to call or visit a local CRO and web design services in your area.